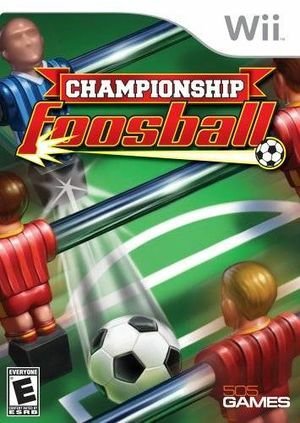 Jump into the fast-paced action and fun of Championship Foosball in your own living room! Using motion-sensing technology in the Wii Remote Championship Foosball creates a realistic gaming experience so you will feel like you are playing at a real table! Create your own team of players and choose to play using official foosball rules or create custom rules to suit your game. Challenge your friends in 4-player action or rise throughout the ranks in single-player mode and play on a host of official tables designed in partnership with the International Table Soccer Federation. The score and player faces during the game will flicker. To fix, enable XFB Virtual. Fixed with Hybrid XFB in 5.0-5874. The graph below charts the compatibility with Championship Foosball since Dolphin's 2.0 release, listing revisions only where a compatibility change occurred. This page was last edited on 2 February 2018, at 05:18.